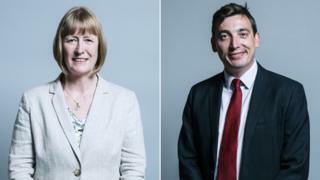 Two Labour MPs who lost no-confidence votes among local party members have told constituents they will not quit. Former minister Joan Ryan, MP for Enfield North, blamed the 94-92 vote defeat on "Trots, Stalinists, Communists and assorted hard-left". Luton South MP Gavin Shuker said he was "sorry a handful of people" wanted to overturn his 2017 win. Others include Frank Field, who quit the parliamentary party last week citing the handling of the anti-Semitism row and bullying in local constituency parties, Kate Hoey, who has voted with the government on Brexit, and another Brexit-backing Labour MP Graham Stringer, who won his no confidence vote. In July, Momentum's national co-ordinator Laura Parker suggested Ms Hoey, Mr Stringer, Mr Field and John Mann - who also backs Brexit - should be deselected, saying there was "no room" for them in the party. No confidence votes carry no official force within the Labour party but local activists could hold a "trigger ballot", where sitting Labour MPs can be forced to compete for selection as a candidate against all-comers, ahead of the next general election. Ms Ryan, who chairs the Labour Friends of Israel group and has been critical of Mr Corbyn, said on Twitter: "Just to be clear, I am not resigning. I am Labour through and through and I will continue to stand up and fight for Labour values." She added that losing 92 to 94 votes was "hardly a decisive victory": "It never occurred to me that Trots, Stalinists, Communists and assorted hard left would [have] confidence in me. I have none in them." The vote was covered by Iranian station Press TV, which published video on its Twitter feed. Labour Party deputy leader Tom Watson said that made a "farce of the proceedings and is not how the modern Labour Party should conduct its affairs". A spokesperson for the London Labour Party said: "Filming of local Labour Party meetings is not permitted, and Enfield North will be reminded of this fact." In 2012, Ofcom revoked Press TV's licence to broadcast in the UK, for breaching rules about editorial control over the channel. It said there was an impression that decisions were being controlled by the offices in Tehran, not the UK. Meanwhile Mr Shuker tweeted a message to his constituents about the vote in his constituency: "It's not part of any formal procedure, so it changes nothing about my role as Labour MP for Luton South. "I'm really sorry a handful of people in the Labour Party want to overturn your vote of confidence in me last year. Their actions say far less about me - and you - than they do about the face of today's Labour Party. "I've not changed, but the Labour Party has." Earlier, Labour peer Lord Blunkett said that both he and former deputy leader Lord Hattersley had complained to the party's general secretary about the activities of Corbyn ally Chris Williamson, who he said was putting some MPs under "enormous pressure" with threats of deselection. Mr Williamson who has been travelling around Labour constituencies with other prominent supporters of Mr Corbyn to make the case for greater democracy and accountability within the party - has rejected claims he is doing it to push for the removal of critics of the party leader. But Lord Blunkett told the BBC: "It would be better if he would spend time in Conservative seats fighting the Tories or defending the very tiny majority he has in Derby North, rather than deselecting his colleagues," Lord Blunkett told BBC Radio 4's Today programme. Lord Blunkett called on "decent people in the Labour Party" to "stand up and take action". Earlier, former Labour prime minister Tony Blair told the BBC it was a "different type of Labour Party" under Jeremy Corbyn adding: "Can it be taken back? I don't know." "There are lots of people associated with me who feel that the Labour Party's lost, that the game's over. I'm kind of hoping they're not right." In response to Mr Blair's comments, a spokesman for the Labour Party said it was "giving a voice and hope to communities that have been held back and ignored for years". "Our policies to end austerity and bring water, energy and rail into public ownership are popular and reflect the mainstream of public opinion."